Bandipur is a hilltop settlement in Tanahu District, (Gandaki Zone) of Nepal. Because of its preserved, old time cultural atmosphere, Bandipur and its surroundings has increasingly been coming to the attention of tourism. It is a picturesque town nesteled in the Himalayan foothills of Nepal, a land as famous for its natural beauty as for the hospitality of the people. 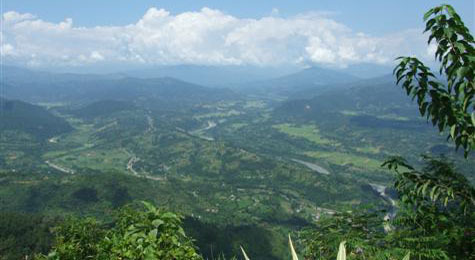 Tanahu lies midway between capital Kathmandu and Pokhara, another tourist destination. Situated on a hilltop above the highway town of Dumre (7 Km), Bandipur and around captivates the visitors with its cultural appeal and pristine scenery. This town has maintained its old-age flavour, and presents sightseers with the heady mix of history, architecture, incredible views, awesome caves, and unspoiled landscapes. Formerly a Magar village, Bandipur today is settled by a variety of Nepali ethnicities with different beliefs: the Bahuns, the Chettris, the Newars, the Damais, Kamis, Sarkis, Kasais, the Magars and Gurungs. Day 02: City tour in Kathmandu calley which includes the visits to many historical and architectural monuments. Day 05: The trail from here heads ahead with gradual ascent crossing gorges, streams and passing through jungle and village settlements. After approx one and half hour, the trail climbs uphill and goes along the ridge of hill and reaches the top of Dubung which takes about 3 hours. This is Min Thapa’s village which is really rich in its own culture & tradition and gifted by nature. Overnight at tented camp at Bhalethunge Danda. Visit the historic Royal throne of the Thapa king of an ancient time when Nepal was divided into many different kingdoms. The views of the beautiful Himalayan ranges and nearby hilly areas seen from here are simply spectacular.